KPTCL 2018 (Karnataka Power Transmission Corporation Limited 2018) recently had issued a notification for the recruitment of 8080 Vacancies in the year 2018. 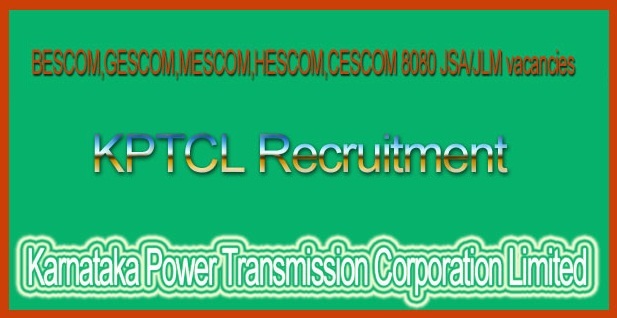 Now the Karnataka Power Corporation is going to recruit 8080 number of vacancies in the number of companies in KPTCL, BESCOM, GESCOM, MESCOM, HESCOM and CESCOM in the year 2018. It’s been a very large number of KPC (Karnataka Power Corporation) recruitment and large numbers of interested & eligible candidates is going to apply online application form for the Junior Station Attendant & Junior Lineman KPTCL Recruitment 2018. Candidates will start applying for the Posts of KPTCL JSA, JLM now on the main web Portals of KPTCL & ESCOMs and here we are going to provide you the direct open links to apply online application form for the KPTCL JSA Recruitment 2018. If you are the candidate those who were in search of JSA, JLM recruitment Posts then you might be good to know that recently Karnataka Power Corporation going to recruit 8080 vacancies in JSA, JLM and if you are the eligible candidate then you can start applying for these posts from Now. KPTCL (Karnataka Power Transmission Corporation Limited) is the single/individual electricity transmission and Distribution Company in the state of Karnataka. KEB (Karnataka Electricity Board) has having 5 major ESCOM along with the KPTCL. List of all five ESCOMs is given below. Candidates those are going to fill the online application form must be passed Class 10th/SSLC examination from a recognized board/school from India. Board will conducts the JSA and JLM Posts Endurance Test on the same day for KPTCL & ESCOMs and here we are giving you full details of the KPTCL ESCOMs Endurance Test. Please follow the Below Given steps to apply online application form for the KPTCL & ESCOMs JSA and JLM Posts Recruitment 2018. Candidates firstly have to visit the main web Portal of the company/corporation. Then After click on the Recruitment/Careers link. Then click on the JSA and JLM Notifications 2018. Then read the advertisement/ eligibility very carefully. Then if you are eligible for these Posts then click on apply online. Then fill the online application form very carefully with all correct details. Download the Application form for further references. Now pay the application fee to the concerned bank. To know more info related to KPTCL JSA recruitment 2018, KPCL JLM vacancies 2018 Please stay connected with the Postalert and follow us on our facebook and google Plus Page. When JLM applications is started sir. I am waiting for this job plz send application date sir. I have got selected in the provisional selection list & would like to know the details regarding further steps.